Welcome to the website of The Letter. Irish Journal for Lacanian Psychoanalysis. Since 1994, The Letter has been publishing three issues per year. 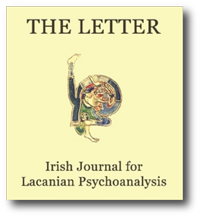 In addition to publishing the psychoanalytic work of members of the Irish School for Lacanian Psychoanalysis (ISLP), the journal has a remit to publish articles arising from work in other fields of enquiry, which engages with Sigmund Freud’s description of the unconscious and Jacques Lacan’s elaboration of that concept. The journal has published articles from philosophers, critics, psychiatrists, from theologians and mythologists, from mathematicians and classicists, from theorists and writers. Put simply, we welcome contributions from scholars, practitioners and artists of all disciplines, and from anyone who engages in questions about the role of the unconscious in relation to knowledge and human endeavour. We do not ordinarily limit the length of contributions. We do however require that these be prepared in conformity with the style sheet of The Letter. The founding in 2007 of The Irish School for Lacanian Psychoanalysis (ISLP) by Cormac Gallagher saw a change in focus for the journal. It became the means by which members of the newly created cartels of the School could publish their ongoing work. In the early years of ISLP, many of us spent some time studying the texts written by Lacan in 1964, 1967 and 1973 on the founding of his own School – the Ecole Freudienne de Paris (EFP). These latter are available on Cormac Gallagher’s website: www.lacaninireland.com. We undertook this task, not only as a way into understanding the structure of psychoanalytic organisations and the nature of a school proper to the psychoanalytic discourse but also to inform ourselves on how we might work within the cartel structure proposed by Lacan. As we continue to formulate an ethos for the School and a context for our work, we are convinced that this was a very worthwhile endeavour, the implications of which have not been exhausted. In 2007, with Issue 39, the journal’s title was changed from The Letter. Perspectives on Lacanian Psychoanalysis to The Letter. Irish Journal for Lacanian Psychoanalysis. The significance of this change was to highlight that ours is principally an Irish journal that publishes psychoanalytic work relevant to practice and study in Ireland. Historically it has additionally represented work by contributors from abroad that makes a valuable contribution to the journal’s project. In the journal, we are attempting to find a way of speaking and writing about psychoanalysis that is less dependent on politicised and universalising discourses. In line with these principles we believe the journal has a national and international relevance in the field of psychoanalysis as well as having a broader inter-disciplinary scope and appeal. For the past few years the journal’s archive has been free to download but this has come at a cost as we struggle to keep the website up-to-date and have it fully available as a research tool. We are also introducing an index of authors and a news section. We hope, over time to have available a full index of contents. This is however, a more long-term undertaking. We trust in your continuing interest and support.